So I have 5 angels in my 125. I have one HUGE male (Bruce) that has decided he wants 2 girls. He is breeding with both of them and the other two angels have paired up as well. This week I had 3 clutches of eggs! 1. Is it normal for angels to be polygamist? 2. I have a community aquarium so the eggs have not made it more than a day so far I was thinking of getting a marina hang on breeder...can I hatch the eggs there with an extra air stone or do I have to separate them and add fungicides? can I just make the box dark? 3. should I sell off the "extra" breeding pair or one of the Bruce's women or keep them all? WOW! I cant answer our questions, but love to hear of your successes! Right, by success, I just mean they are all in there and happily living out life. If you get babies that is serious bonus! Are you certain re the sexing? Two FMs will spawn together but the eggs will not be viable. If you are able to abserve the actual spawning, you can see both depositing eggs in such cases. I was able to pull huge angel spawns to be hatched out in a 2.5 gal tank. Sorry for poor pic skills. The leaf was cut and moved to the hatching tank. - Other fish see eggs, wigglers and newly free swimming fry as lunch. - The parents will eat their own eggs before letting them be eaten by something else. 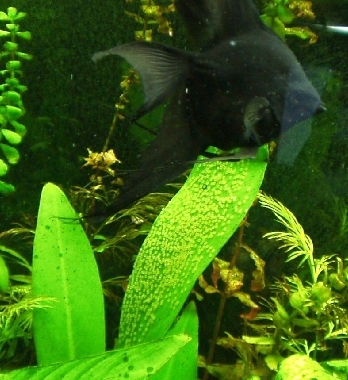 - New free swimming angels need live food inititially and they need it several times a day. A few more observations- Angel breeders will usually suggest one have two 55 gal. tanks for fry raising for each mature spawning pair one has. If your are serious about spawning angels and raising their fry, you should have a separate tank for each pair. This should be bare bottom, with a slate or other spawning surface. A sponge filter would be a good choice as well. Ok so I did watch one two of the pairs spawn, it looked like one would lay eggs and the other would follow behind but did not lay eggs. I am fairly certain of at least One male the largest and two females. the smaller pair I'm not positive about. The trio I am 95% I have two females and one male. I figured it would be nearly impossible to get anywhere in the community set up. The angels seem to protect the eggs from the other angels but don't really pay attention to the Denison barbs which apparently love angel fish eggs. So I will move the next batch out. I am not dead set on getting large amounts of fry. I think it would be cool to get some hatched, but if it never happened I wouldn't be devastated...hence letting them go naturally for these first 4 or so rounds. I have a 75 with neons and danios, but I also have a few 10 gallons for the fry to start in. I have sponge filters and other extra canister filters that can be moved around. I have 3 canisters on my 125 right now...I just got a Eheim 2217 and I have two others already on it so bio-filtration shouldn't be a problem. The first pair (large male and red shoulder female) have had probably 4-5 clutches of eggs, this last week was the first time to get eggs from the other two females. thanks for the link I'll check it out. Angelfish have long been a staple of the aquarium hobby due to their elegant appearance and graceful movements, and with new varieties consistently becoming available, they make an excellent choice for many home Aquarius. Page created in 20.06 seconds with 18 queries.